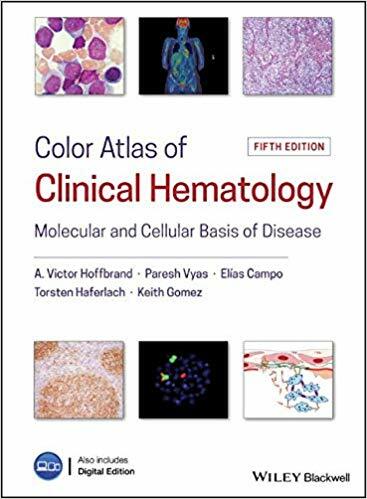 Provides coverage of the pathogenesis, clinical, morphologic, molecular and investigational aspects of a full range of blood disorders seen in daily practice The revised fifth edition of this renowned atlas presents readers with a comprehensive, visual guide to clinical hematology, featuring 2700 full-color photographs and figures depicting the spectrum of hematological diseases. Ranging from photographs of the clinical manifestations and key microscopic findings to diagrams of the molecular aspects of these diseases, the book provides up-to-date information of the blood diseases that clinicians encounter every day. Color Atlas of Clinical Hematology: Molecular and Cellular Basis of Disease offers the reader an understanding of normal cell machinery, and of the molecular basis for such processes as DNA and cell replication, RNA species, trafficking and splicing, protein synthesis, transcription factors, growth factor signal transduction, epigenetics, cell differentiation, autophagy, and apoptosis. The text goes on to explore how these processes are disturbed in the various diseases of the bone marrow, blood, and lymphoid systems. Helps solve difficult diagnostic challenges and covers complex principles using highly illustrative, full-color images Explores all aspects of benign and malignant hematology, including blood transfusion and coagulation with extensive coverage of the pathogenesis of common clinical entities Provides a quick and easy reference of key diagnostic issues in a comprehensive yet concise format Includes and illustrates the WHO Classification of Hematologic Malignancies Illustrates the new knowledge of the molecular basis of inherited and acquired blood diseases Color Atlas of Clinical Hematology: Molecular and Cellular Basis of Disease is the must-have resource for both trainee and practising hematologists, and for every department of hematology.